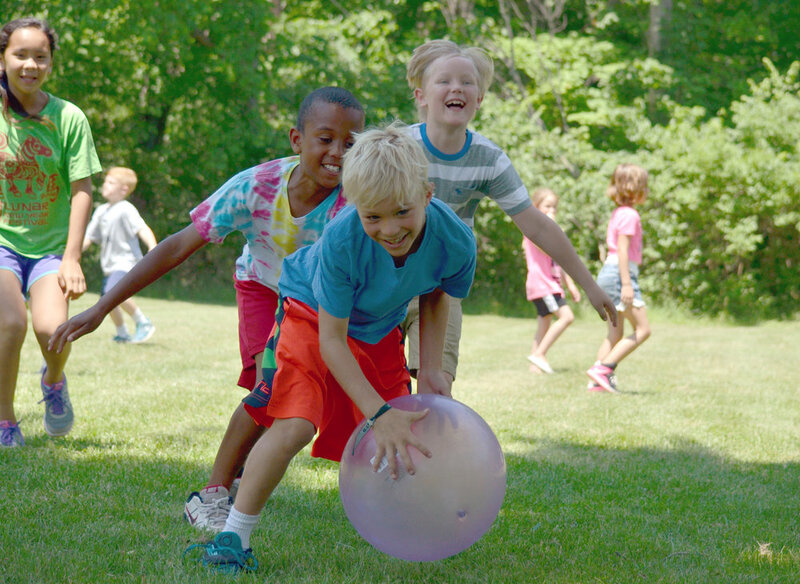 Designed for students ages 7-12, this summer day camp focuses on reaching the “whole child” through academics and activities that build and encourage motivation, self-esteem and social skills. Mornings at Camp Delafield focus on four academic rotations: one-on-one Orton-Gillingham, and small group instruction in written expression, math, and STEM. Afternoons focus on building confidence and making friends through summertime camp fun! Check out our Day in the Life of a camper below! Mondays - Thursdays 8 a.m. - 4 p.m. and Fridays 8 a.m. - 12 p.m. Tuition is $3500. Need-based financial assistance is available. Have more questions? Check the FAQ’s below or call Dii at 317-222-6635. 2019 Camp Delafield registration is now open! Please click here to fill out an an application. Are you a returning camper? Here’s a fast track application for 2019! Has your camper "aged-out" of the traditional Camp Delafield experience? Do they enjoy being an example and mentoring younger students? The Camp Delafield Counselor in Training (CIT) program may be just for them! CIT's will receive morning academics daily and serve alongside our counselors as volunteer counselors in training at Camp Delafield. Morning academics include one hour of: one-on-one Orton-Gillingham, and small group instruction in written expression, math, and STEM. Afternoon responsibilities include assisting staff with daily procedures, encouraging and motivating campers to participate in team building and recreational activities, and assisting staff with closing camp at the end of the day each day. Tuition for the CIT program is $2200. A limited number of CIT positions are available. To apply to be a 2019 CIT please fill out this application. We are celebrating 30 years of Camp Delafield in 2019! My mom just dropped me off at camp, and I usually play basketball while I wait for my new friends to arrive. Mr. Herman, he’s the Director at Dii, comes and usually starts the day off with a silly question or funny joke. I really like laughing first thing in the morning. My second session is when I get to go with my Orton-Gillingham tutor. She helps me with my reading. I really like that she’s just working with me during this time, and I get to work at my own pace and ask any questions I need to. Snack time! I get to eat a quick snack and have a short run around on the playground. Next up is my math group. We’ve been working on my math facts, and my teachers are helping me understand the fundamentals of geometry. At school, it sometimes seems like I’m the only one who’s not getting my math facts quickly, but at camp I see there are a lot of other kids just like me. My favorite part of the morning is STEM class. It’s SO fun. I get to build bridges and fly kites. Plus, I get to laugh a lot. Lunch Time! My mom packs a lunch with all of my favorite things. I usually eat pretty fast because when I’m done I get to go outside and play. Every afternoon at camp is different. Some days we go swimming or take a walk in the woods. Other days we play a bunch of playground games. Every week we get to have art class with Dante - he’s awesome! Dad picks me up. Boy am I tired. Where is Camp Delafield Located? We are located on the campus of Colonial Hills School. At this time, we do not offer before and after camp care. Campers are welcome to come as early as 7:45 a.m. and pick up in the afternoon is at 4:00 p.m. Does my child really get one on one Orton- Gillingham tutoring every day? Yes! We have trained Orton-Gillingham tutors that will meet with your child every day to work on their reading skills. There’s a saying in the Orton Gillingham community, “Work as fast as you can but as slow as you have to.” Our tutors are here to do just that for your camper. What is the ratio for students to teachers in the morning small group sessions? We have a 5 campers to 1 teacher ratio for our small group multi-sensory morning classes. Is there financial aid assistance available? Yes! Dii works hard all year to raise money that is used for scholarships for all of our services. When you fill out a camp application form, please indicate that you are interested in receiving financial aid. Because our scholarship funds are limited we ask families to fill out a FACTS application to be considered for financial aid. (FACTS charges $30 to apply for financial aid).